Both cooling colors, blue and green make a dynamic duo. New beginnings, tranquility and growth often come to mind when we think of the pair. It’s also one of my favorite color combos. sources: 1. | 2. | 3. | 4. | 5. | 6. What’s your favorite color combo? I used these colors in my dorm room in 1970! What a hoot to see them called “fresh”!!!! I love green with anything! Beautiful combination Kristie! Will I see you next week? This has always been my go-to color palette. I've been very attracted to pink and grey lately, which is strange for this non-pink lover. I am really into navy lately. Love it paired up with green. Oh, that Clayton Gray stool is so pretty. I just love the blue/green combo. It is fresh and is such a great way to bring the outdoors in. Happy weekend. Love the combination…so fresh and alive! 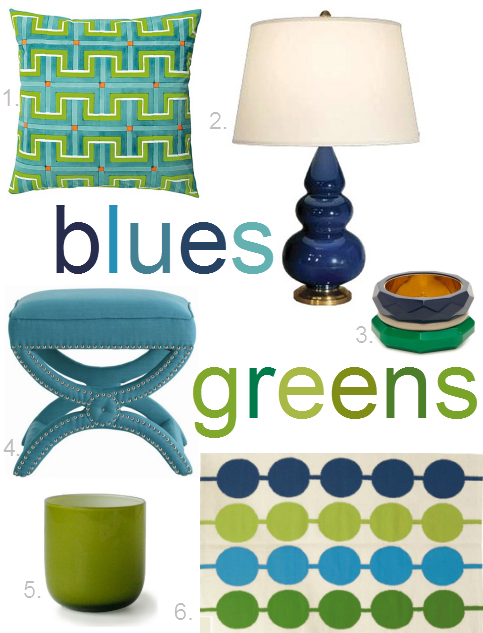 I'm a huge fan of blue and green too! I'd like to take all of these picks home with me!